The Natural History Museum have released some wonderful animal inspired books for kids of all ages, just in time for summer. 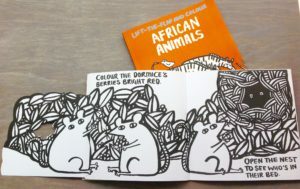 The Lift-the-Flap and Colour series is an innovative new colouring-in range created in partnership with Frances Lincoln Children’s Books to stimulate a life-long passion for wildlife, ecology and conservation. Following on from the success of Jungle and Ocean, new titles Forest and African Animals will delight and inspire any young animal enthusiast. These stylish yet sturdy books contains flaps on each page that lift to reveal hidden text, new animals and extra colouring-in sections. 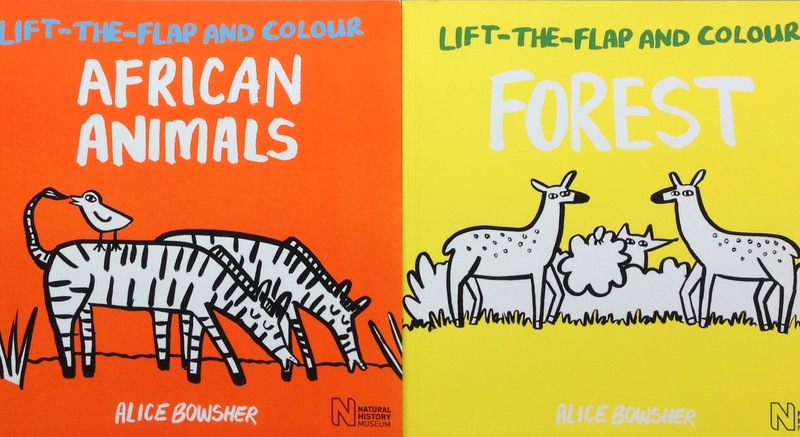 Illustrated in bold, black and white by Alice Bowsher throughout, the pages offer informative, rhyming text which has been throughly fact-checked by leading experts to ensure children understand the information given relating to the natural world. Revealing animals in their natural habitat, from the plains of the savannah to woodland undergrowth, each interactive page allows the text to unfold before your very eyes! Released in paperback at £5.99 each, the Lift-the-flap and Colour books are suitable for children ages 2+. 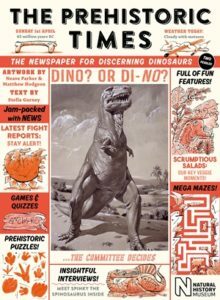 The Prehistoric Times is a dinosaur activity book set-up in the style of a newspaper from 65 million years-ago and is packed full of jokes, puzzles, word searches, dinosaur interviews, colouring-in activities, features and even weather reports! 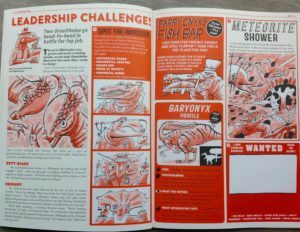 Written from the point of view of a wise-cracking dinosaur editor, this uniquely laid-out book boasts engaging scientific content that has also been fact-checked by Natural History Museum experts. Beautifully illustrated to include NHM archive images from 1950’s illustrator Neave Parker, readers can expect to be taken on a light-hearted jaunt through prehistory in this hilarious, laugh out loud book, learning as they go. Striking, informative and a whole lot of fun! Out now in paperback at £5.99, published by Frances Lincoln Children’s Books.